The Queens County Young Democrats (QCYD) is an organization of Democrats between the ages of 16 and 36, dedicated to advancing the highest principles of the Democratic Party and inspiring the participation of all people in politics, public policy and service. 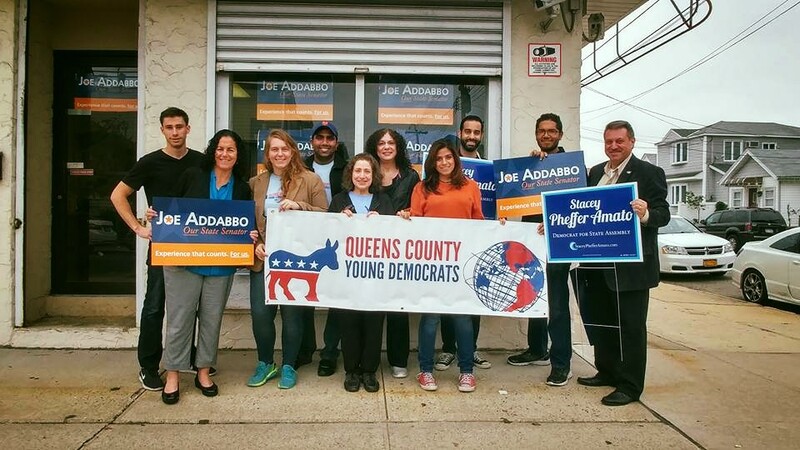 As the officially recognized youth arm of the Queens Democratic Party, QCYD is especially focused on inspiring, educating and involving young people who want to make a difference. Queens County Young Dems representing their community with the New York State Young Democrats. QCYD members help elect Democrats at the city, state, and federal level, and also hold elected representatives accountable to fight for democratic issues. QCYD actively supports Democratic candidates and causes in the fights that matter most. Through organizing hundreds of volunteers shifts, speaking to thousands of voters at their doors and on the phone, and collecting signatures for critical ballot drives, we have made a name for ourselves as Queens' boots on the ground in local, state and federal elections. In the year 2016, we organized over 100 volunteer door-knocking shifts to assist State Senate candidate Todd Kaminsky (D) in his race to win a key state Senate seat in Long Island, formerly controlled by then-Senate Majority Leader Dean-Skelos (R) - a close race which he won by only less than a thousand votes, demonstrating the importance of on-the-ground field efforts. In Trump's America, QCYD is committed to organizing for action to push back on any agenda that espouses hatred, bigotry and intolerance. Since Trump's election, we Marched on Washington, stood with Astoria's Muslim community, and rallied for LGBT rights at Stonewall. We will continue to stand firm on the ideals that define us as Democrats and as New Yorkers for the next four years and beyond. We work to give back to our communities through beautification projects and voter registration drives. To date, we have registered over 1000 Queens voters at events such as the Jamaica JAMS festival and on college campuses across the borough, and volunteered at Roy Wilkins and Astoria Parks to beautify open spaces in concert with New York City Parks and local elected officials. We also have organized three charity basketball games pitting elected officials vs. young democrats, raising thousands of dollars for food pantries and youth-driven organizations in Queens.